It's currently holiday season so things have slowed down and there aren't too many developments this month. One thing that is now underway is the program of work to improve the sports facilities at the town's swimming pool. This will involve an extension to the building which will require demolition of the toilet block in Castle Street and consequently the area is fenced off prior to work starting. Elsewhere there is plenty of evidence of 'Dursley in Bloom' as tubs of very colourful flowers have appeared all over town making a very pleasant sight. 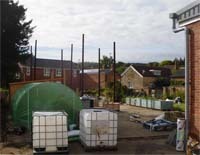 Work has now started on extended the swimming pool building and adding more facilities. For this to go ahead the old toilet block in Castle Street is to be demolished. Fencing surrounds the toilet block in readiness for demolition. The diggers are going in at the front of the swimming pool during ground work preparation. More of the colourful tubs, this time one at the Broadwell. A view along Castle Street showing one of the very colourful flower-filled tubs that have been planted up around town. A great view across the bowling green towards the side of the Priory building. Ongoing work at the 'secret garden' behind the Lister Hall, part of the Chantry in Long Street. The Old Bell (now renamed 'Ye Olde Dursley Hotel', though still called the Old Bell locally) has re-opened after being granted a new license.